I love that paper in bottle contact form idea. Reall interesting dropdown contact form! Color usage and contact detail formation is very balanced, I bet this site is completely created on grid. I only don’t like that standard Submit button. 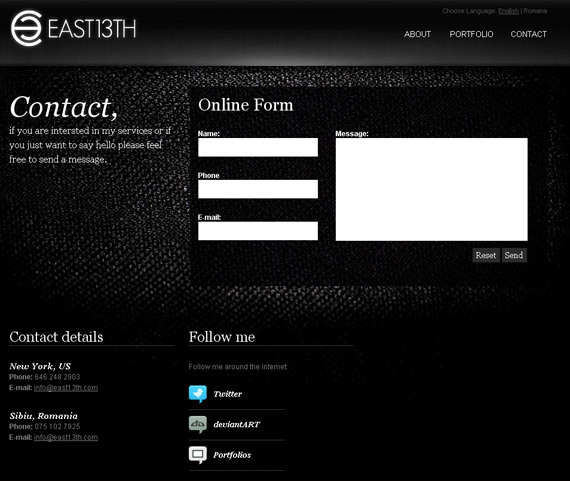 Harmonic and trendy contact page, look really professional. Very compact and light minimalistic approach – something different. 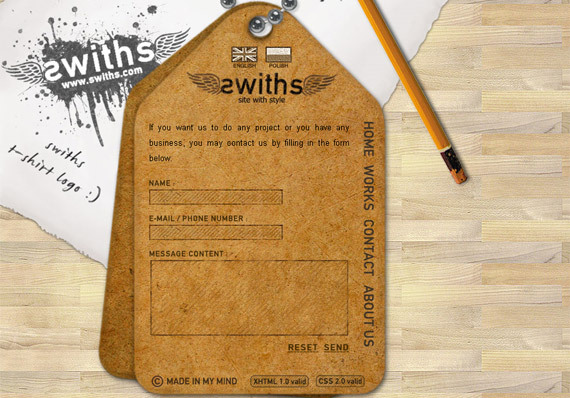 Large, but very effective contact page as their whole website! What can I say here – everybody should know how successful Envato network is, no wonder website is also created very impressive! Really huge and long contact page, I don’t judge how good is this example, but interesting in one or another way! “Leave us a message…or..leave us a doodle!” – great idea! 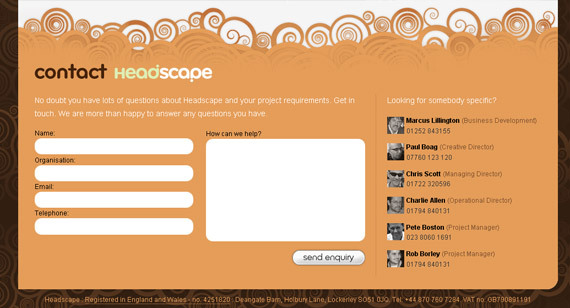 Headscape puts effectively their contact form in footer, interesting integration. 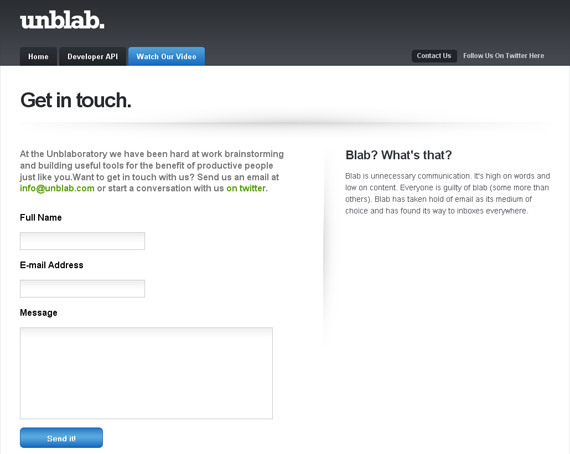 Simple signup form, but I like that appealing sign up button as accent. 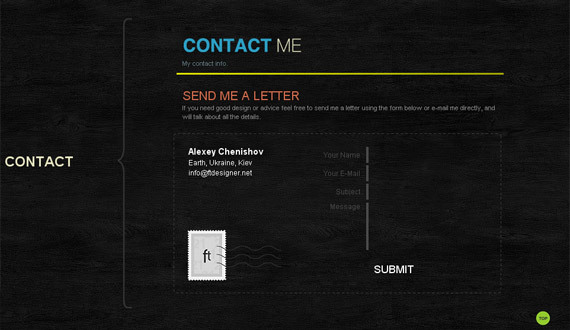 One more interesting example where contact form is found on website footer. 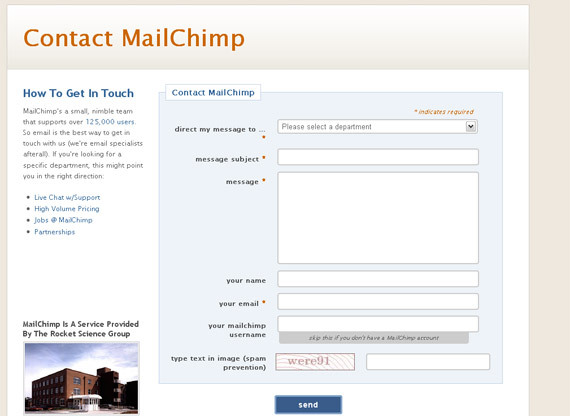 Big, yet good looking contact form. Modern solution with hand-drawn trendy elements. Just amazing, very appealing design and no Flash used at all! Definitely check out this website! Atebits always have unique approach and idea to everything, contact section is no exception. Koodoz Contact section is full of inviting texts, requests and most important overview looks professional despite of all the information. For me this contact form is a little bit too dark, but I am sure dark website lovers will enjoy this website and Hire section. One page website, click to Contact and slide to get in touch! This contact page offers everything You should need in contact section – get connected, visit gallery or just send simple message to them! Interesting color usage,vertical navigation and style approach used in this design. Catchy! Big fan of elegant simplicity as you know, one more beautiful example. 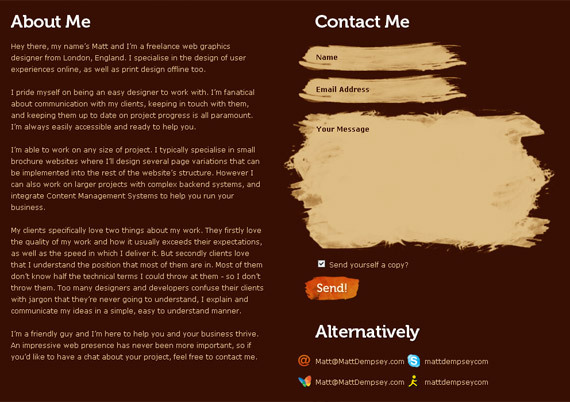 One more harmonic simplicity example, really professional website. 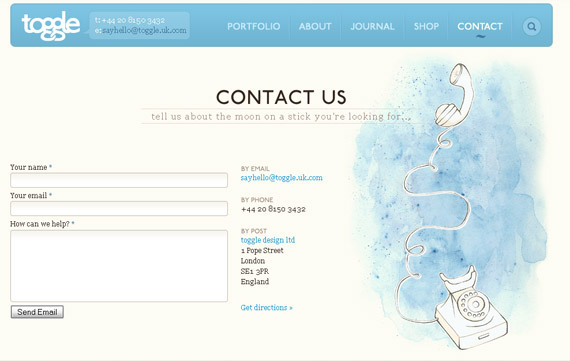 Beautiful style and approach, one of my favorite websites and designs! Check out and you’ll see why! Very harmonic Flash website with animated clouds like in old animation show, contact form looks like sketched going very well in overall context. Site using hand-drawn trending elements in really modern way! Click to contact button and slide down to contact form! Try, click and switch contact boxes and you feel a little earthquake in your screen! No worries it’s not temporary! Suprisingly I found also designer from Latvia (I am from Latvia too) with amazing website design and extremely creative contact page! Click to contact button to slide down and get inspired! Get flashy inspiration, simple – yet eye-catchy and original! Unique website design, and impressive contact page, effectively using white space too. Simplicity is everything – very elegant. Somehow catched my attention with colors, white space and simplicity. Tweet, tweet and contact! Beauty! 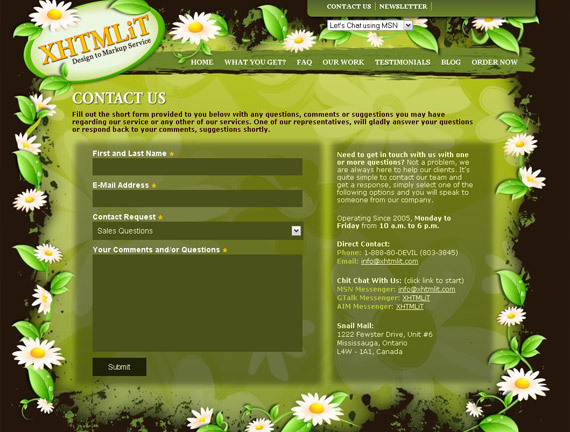 Simple and good looking contact form with harmonic colors. I enjoy those harmonic colors and watercolor type telephone graphic on the right. Use that white space and harmonic colors!! 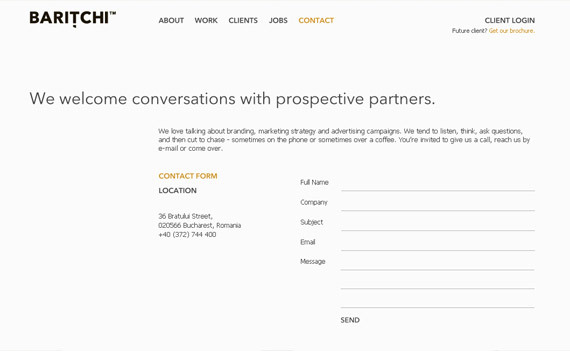 Excellent, clean contact page with no images at all (except typographic logo). Seems very simple contact section, but I couldn’ resist to put this example here as well – it’s clean and professional as whole website and their service! 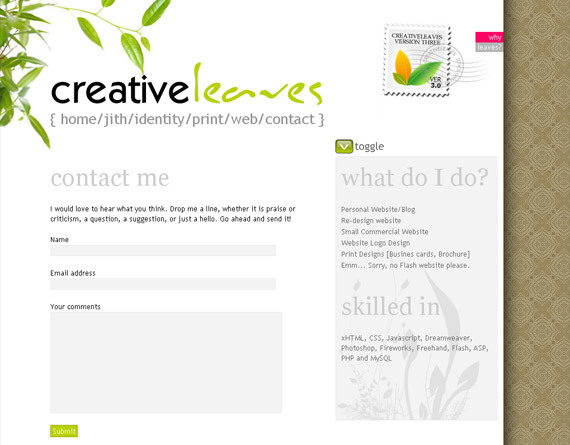 Light website with subtle green accents and stamp representing older communication form, simple and great! Even if you don’t have anything to say, this contact form invites to fill empty fields! You simply will love this beautiful Flash website created in 3D look, contact section is outstanding! Great integration of contact form and GoogleMaps showing company’s location. Fill the sticker to send a message to Jay, interesting workdesk approach with few Flash elements. Excellent approach and unique design!